Make your own DIY tea towels to use or give as a gift. They have so many wonderful uses in the kitchen. I have been slightly obsessed with the apple and pear print I designed for the November backgrounds. Everyday I see it on my phone and computer it makes me smile. So much so that I wanted to find ways to use it again and again. I started with using the design on the printable leftover pie boxes. And then immediately wanted more. With Thanksgiving on the horizon and already spending more time in the kitchen, I knew the design would be perfect for some DIY tea towels. Once I had the idea, I immediately uploaded a design to Spoonflower to print. Then I had the longest week ever waiting for my custom printed tea towels to arrive. Thankfully Spoonflower was much quicker than originally quoted. As soon as the fabric arrived, I put off everything else on my to-do list to sew up my DIY tea towels because the pattern and colors and design were so fantastic! Is it silly to say I am in love with my new tea towels? I made 4 different designs from the apple and pear print to give me some variety. I love that they all go together in a set, but they are each fun and different in their own way. And even better, the 4 custom printed tea towels on high-quality cotton/linen fabric cost me less than $30. When compared to other high-end towels, that is a huge savings. DIY tea towels are so much fun to make and they make wonderful handmade gifts. Or even better, you can wrap homemade treats in an individual tea towel for an extra special gift. I know I would love to receive a loaf of homemade bread lovingly wrapped in a beautiful decorative tea towel. If you want to make your own tea towels, for yourself or for gifts, I have all the details you are going to need! 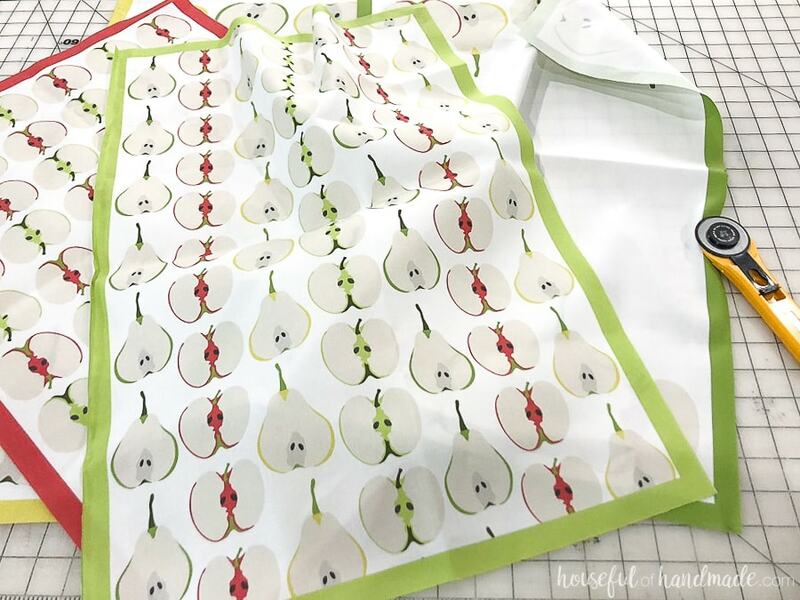 Whether you decide to design your own custom printed tea towels, buy already printed fabric, or order these adorable apple & pear tea towels, you will be ready to use them in no time! 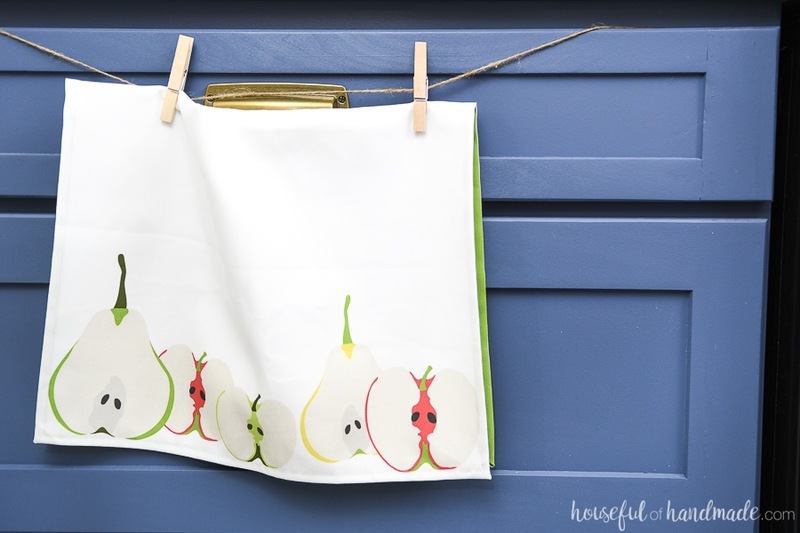 You can purchase the exact print I used for my DIY tea towels on Spoonflower here. The hardest part of making your own tea towels is figuring out what fabric you need and how much. Not anymore! I’ve answered all your questions below so you will be armed with everything you need to make the perfect DIY tea towels. What size is a tea towel? The standard size of a tea towel is 18″ x 28″. 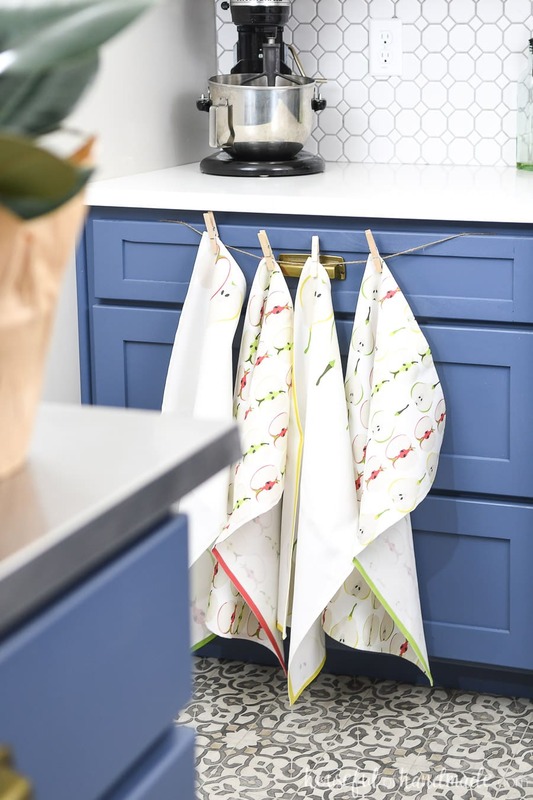 But if you want to make your own tea towels, you can easily do it from just 1 yard of 54″ wide fabric. Cut the 54″ x 36″ piece of fabric into quarters to equal 18″ x 27″. 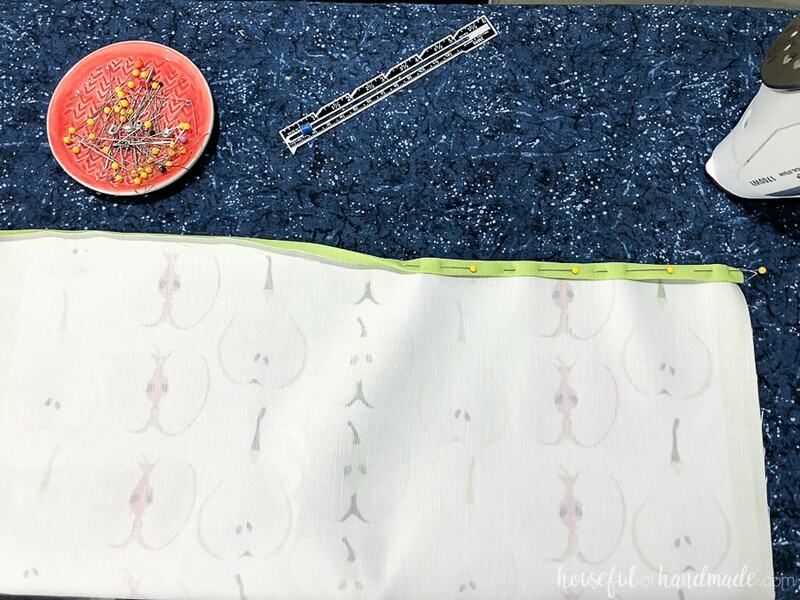 Once hemmed, you will have 4 DIY tea towels measuring about 16 1/2″ x 24 1/2″. The perfect size for a tea towel! 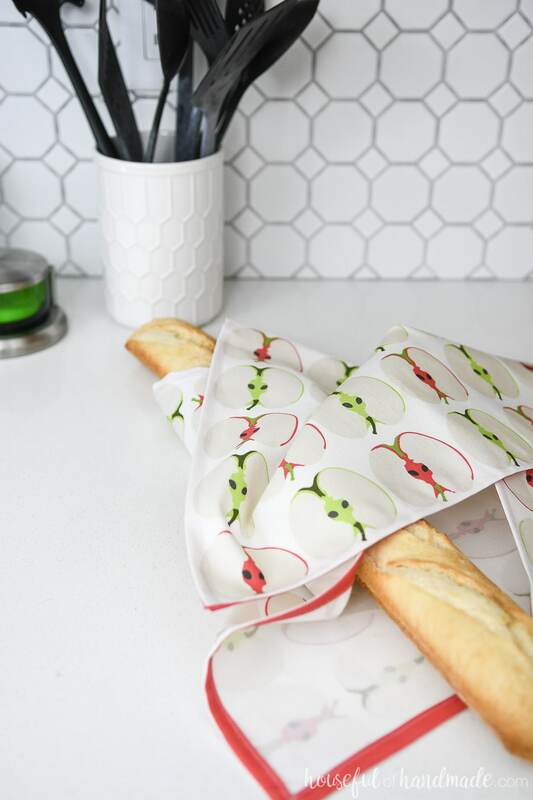 If you want to make your own custom printed tea towels, plan to make the design fit the 16 1/2″ x 24 1/2″ area so that you have plenty of room for a hem. 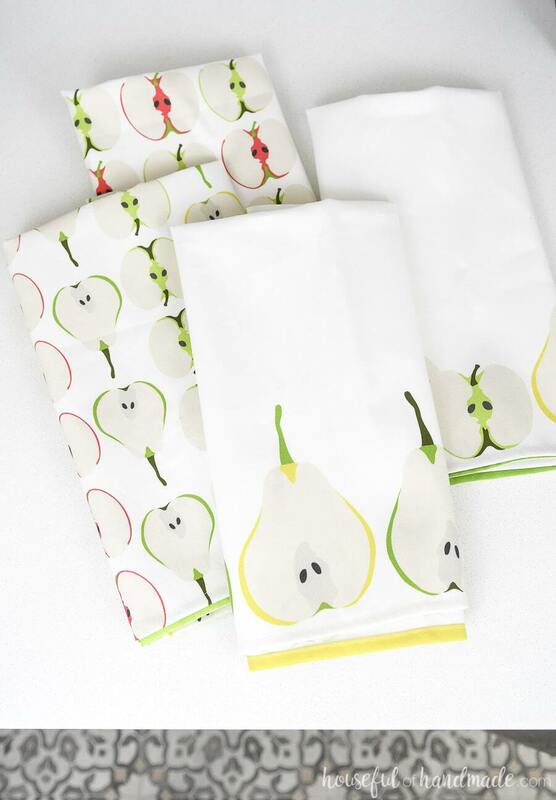 Or you can use my beautiful apple and pear tea towel designs. Order them here! 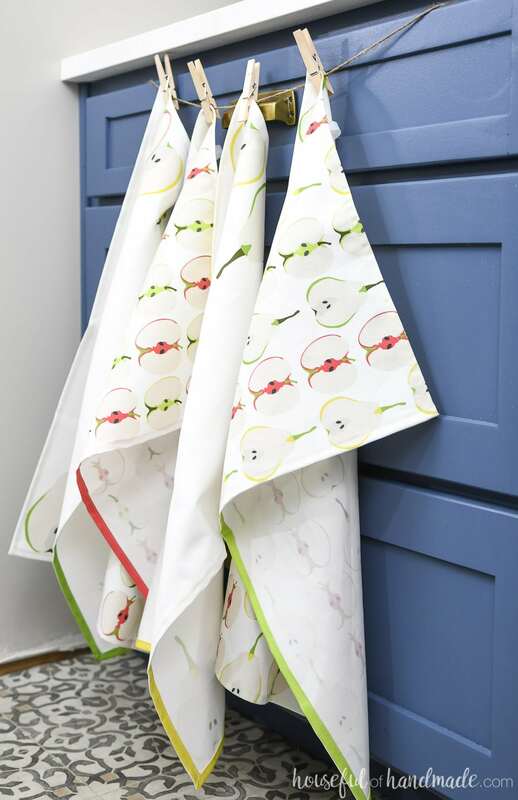 What is the best fabric to use for tea towels? Tea towels need to be made from absorbent materials. Skip the man-made fibers (like polyester) and use natural fibers like linen and cotton for soft and absorbent tea towels. Choose high-quality thick fabrics for tea towels that last a long time. Also, the thicker fibers and tighter weave of the high-quality fabric will mean more fabric for absorbing. For my DIY tea towels, I chose a cotton/linen blend with a canvas weave. Specifically it is called Linen Cotton Canvas Ultra on Spoonflower. The thicker canvas material will hold up over time and the linen and cotton fibers will soften with use to be the perfect kitchen towel. How to sew a tea towel? Step 1: Give your fabric a good ironing to make sure it is nice and flat. Step 2: Fold over 1/4″-3/8″ hem on each edge of the tea towel. Iron it to stay. I love using a seam gauge to make quick work of hems. Then roll over the hem 1 more time to fully enclose the edge of the fabric. Iron again and pin to keep the hem enclosed while sewing. Step 3: Cut a 4-5″ piece of the grosgrain ribbon and tuck it under the hem in one corner, on a diagonal. Step 4: Sew the hem with a standard straight stitch. 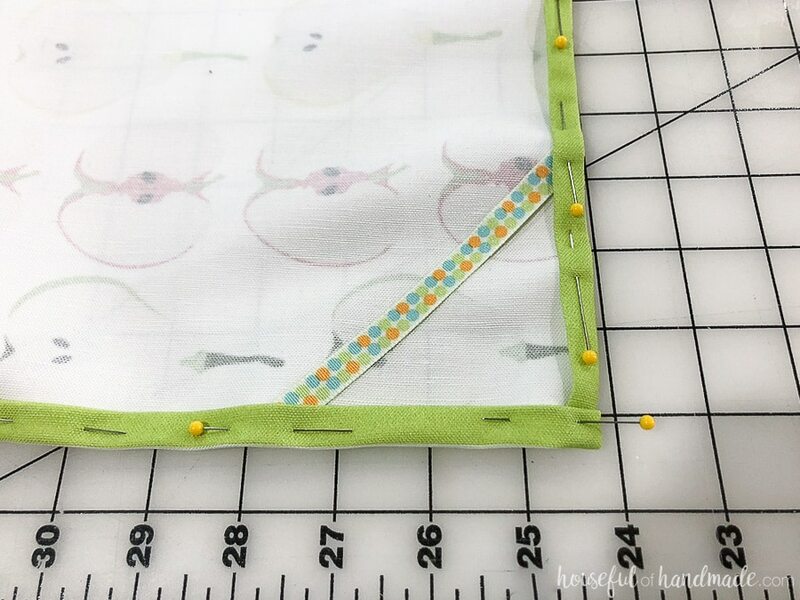 Keep the stitch line close to the inside edge of the hem. Step 5: Wash your hand towels before use to soften them up and get them ready for the kitchen! What are tea towels used for? I know tea towels are pretty, but they are very useful too! 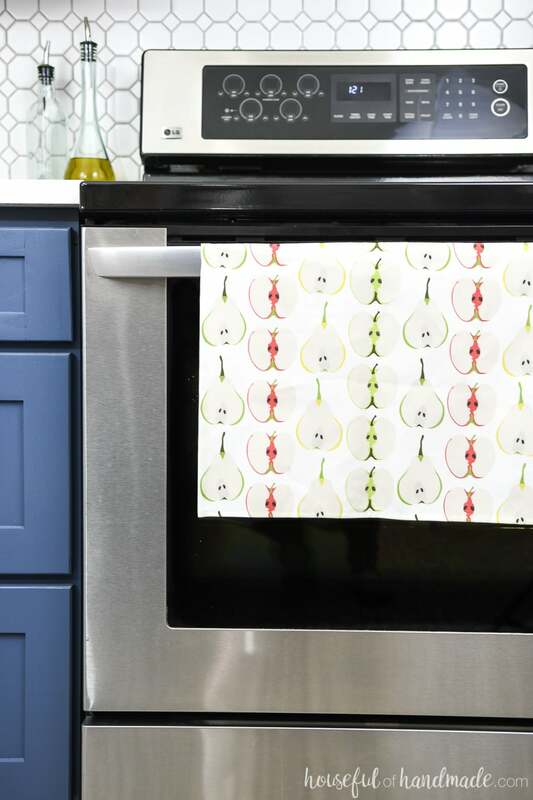 After you’ve filled your kitchen with fun decorative kitchen towels, you will love these 10 ideas on how to use a tea towel. Cover dough when rising to protect it and help keep the top from drying out. Line a basket or serving dish. For drying salad greens. And then add one to the bag when storing greens to absorb moisture and keep greens crisper longer. 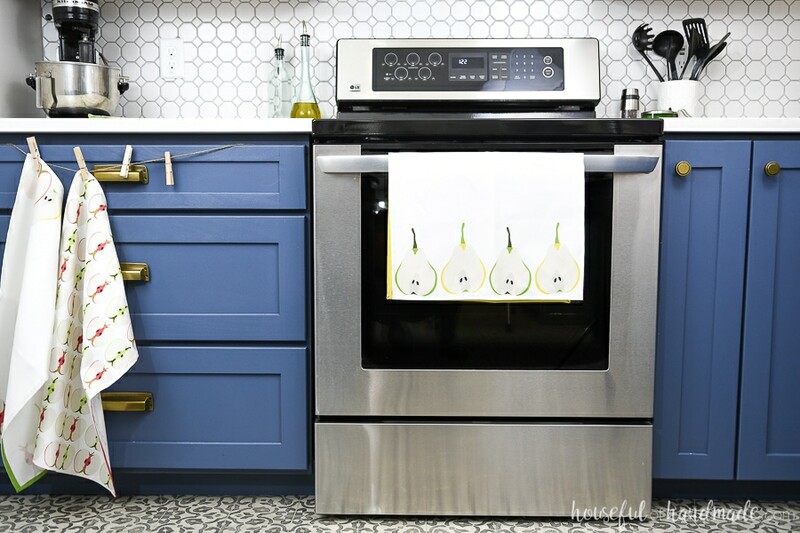 Place a damped towel under a cutting board to keep it from sliding around. Line the bottom of a fruit bowl to cushion fruits. Use as napkins or placemats for a fun table setting. To cover food to keep it warm. Line a crisper drawer to absorb excess moisture. To wrap handmade goodies or gifts. As a wonderful handmade gift. Now I hope you are ready to go sew up your own mountain of tea towels! I know I am. Maybe soon I will have a fun Christmas tea towel design ready to purchase in my Spoonflower shop.